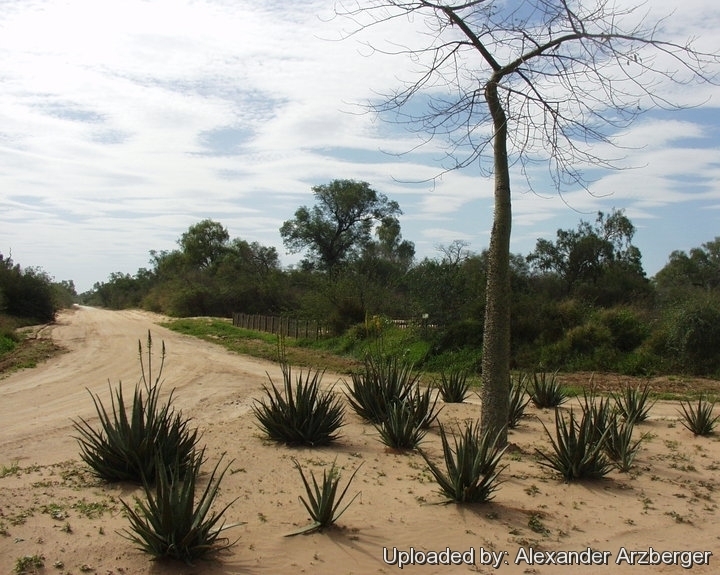 Aloe barbadensis and Chorisia speciosa. Origin and Habitat: The natural habitat of the Ceiba speciosais are the tropical and subtropical forests of South America (north-east of Argentina, east of Bolivia, Paraguay, Uruguay, Ecuador, Peru, north-eastern and south-eastern Brazil). Outside of private gardens around the world, it is often planted along urban streets in subtropical areas such as in South Africa, Australia, northern New Zealand and the southern USA, although its prickled trunks and limbs require safety buffer zones, especially around the trunks, in order to protect people and domesticated animals from its prickles. Description: Ceiba speciosa is a species of deciduous tree with an immensely swollen, bottle-shaped trunk, 2 m in diameter at widest part and with a spreading, rounded head. It usually grows to 6 to 12 metres, but sometimes reaches more than 25 metres in height. 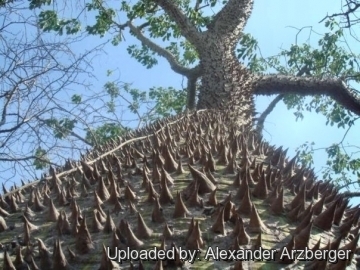 It is commonly known as the Silk Floss Tree. It belongs to the same family as the baobab (Adansonia digitata) and the kapok (Ceiba pentandra). Another tree of the same genus, Ceiba chodatii, is often referred to by the same common names. It was originally named Chorisia speciosa after the artist L. L. Choris, who accompanied Otto Van Kotzebue on South American expeditions. Like other members of the Bombacaceae family, these trees produce a seed pod filled with silklike "cotton" in which the seeds are embedded. Chorisia is known for its ornamental flowers and for the ominous thorns that cover its trunk and branches. The individual flowers resemble huge orchids, 12 cm or more across. Flowers are either satin pink, rose, or violet at the outer half of the petal. The inner portion can be creamy-white or yellow with brown markings that radiate from the throat. As a deciduous tree, it is completely bare of leaves and flowers during the winter months, especially when growing outside of its native South America habitat. The diversity of C. speciosa flower colouration from tree to tree is not replicated from seed. Stem: The trunk is bottle-shaped, generally bulging in its lower third, measuring up to 2 metres in girth. The trunk is also studded with thick, sharp, conical, bluntly thorn-like protuberances. When the trees mature, these fall off and the theory is that this is nature's way of protecting the young bark from grazing animals. This thorns also deter wild animals from climbing the trees. In younger trees, the trunk is green due to its high chlorophyll content, which makes it capable of performing photosynthesis when leaves are absent; with age it turns to grey. The branches tend to be horizontal and are also covered with prickles. Leaves: Palmately compound (digitate) with five to seven long leaflets. Flowers: The flowers measure 10 to 15 centimetres in diameter and their shape is superficially similar to hibiscus flowers. The petals are 5, creamy-whitish or yellow with dark chestnut-brown streaks that radiate from the centre and pink-or violet towards the tips, spreading to recurved. The staminal column is usually fused together along its entire length but is sometimes found with the filaments partially or completely separated. Outer sterile staminal tube to 2.5 cm long, inner tube to 10 cm long. Style exserted about 1.5 cm beyond stamens. Their nectar is known to attract insect pollinators, as well as hummingbirds. Blooming season: C. speciosa flowers profusely in summer and autumn (between February and May in its native Southern Hemisphere), but can also bloom at other times of the year. Fruits (capsules): Woody, ovoid, to 13(-20) centimetres long and 7 cm in diameter, containing bean-sized black seeds surrounded by a mass of fibrous, fluffy matter reminiscent of cotton or silk. Chromosome number: 2n = 69-87; n = 43. This species is presently considered by Gibbs & al. (1988) to be a polymorphic complex with an extensive distribution in S America. They consider that all previously recognized species of Chorisia are now referable to the single species Ceiba insignis. Similar species: C. speciosa and Bombax ceiba saplings look very similar when not in bloom. The colour of the bark distinguishes them: C. speciosa is predominately green, while Bombax ceiba is predominately brown. In succulent plant collections this attractive species with its prickly pachycaul stem and spectacular flowers is usually still met with under the name Chorisia speciosa. 2) Wikipedia contributors. "Ceiba speciosa." Wikipedia, The Free Encyclopedia. Wikipedia, The Free Encyclopedia, 1 Sep. 2016. Web. 1 Sep. 2016. 3) Gibbs, P. E.; Semir, J. Año "A taxonomic revision of the genus Ceiba Mill. (Bombacaceae)", Anales del Jardín Botánico de Madrid, 60 (2), 2003. Cultivation and Propagation: Ceiba speciosa is quite easily grown from seed and is frequently planted in parks in frost-free climates around the World for its interesting growth form and free-flowering nature. This species is one of the most cultivated of the Ceiba genus, and can put on an impressive floral display in autumn, when the leaves drop. In built-up areas it will prove to be a troublesome one as the roots effect forceful entry into cracks in buildings, roads, drains, etc., and pass through or under and disturb foundations. It grows best in subtropical climate and heavy rainfalls but fairly drought-resistant too. It grows fast in spurts when water is abundant but don't over-water Saplings can be effectively grown in containers for many years before becoming too large and requiring to be planted into the ground. In this manner one can move them out of the cold into a warm position in a glasshouse or indoors behind a sunny window to prevent frost damage. It can be also trained as a bonsai tree. HardinessIt is only semi-hardy and tender when young. The are only suited for tropic and subtropics and provide a minimum winter temperature of 0°-10° C as they cannot tolerate frost. Uses: The silk floss tree is cultivated mostly for ornamental purposes. The cotton inside the capsules, although not of as good quality as that of the kapok tree, has been used as stuffing, soft and flexible, and is employed in packaging, to make canoes, as wood pulp to make paper, and in ropes. From the seeds it is possible to obtain vegetable oil (both edible and industrially useful). Ceiba speciosa is added to some versions of the hallucinogenic drink Ayahuasca.